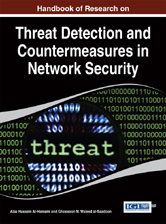 Editor/Author Al-Hamami, Alaa Hussein and Waleed al-Saadoon, Ghossoon M.
The Handbook of Research on Threat Detection and Countermeasures in Network Security presents the latest methodologies and trends in detecting and preventing network threats. Investigating the potential of current and emerging security technologies, this publication is an all-inclusive reference source. WHAT COULD GO WRONG IN SOCIAL MEDIA? WHY DO ATTACKERS SUCCEEDED IN THEIR ATTACKS?